For a brief moment, the sound of a train rumbling past Whistle Stop Park early Sunday morning drowned out the pumping music and buzz of excitement that was building in anticipation of the 13th annual Niwot Trot 5k. This quintessential Niwot experience encapsulated the uniquely Niwot feel of the entire day. Runners of all ages eagerly awaited the start, and together our school community welcomed a total of 530 registrants (a new record!) onto the streets and neighborhoods of Niwot. An impressive 50% of the racers were students! Beautiful sunny weather welcomed the runners, walkers and every speed in between. Both the elementary boys and girls records were broken, and many runners lowered their personal bests on the fast out and back course. Twenty teachers and staff from NES participated, encouraging all our young athletes on their incredible performances. How awesome is that!? It was hard not to find a smiling face during the high energy youth-centric awards ceremony. The love and recognition showered upon all the winners makes us proud to be part of the inclusive NES community! 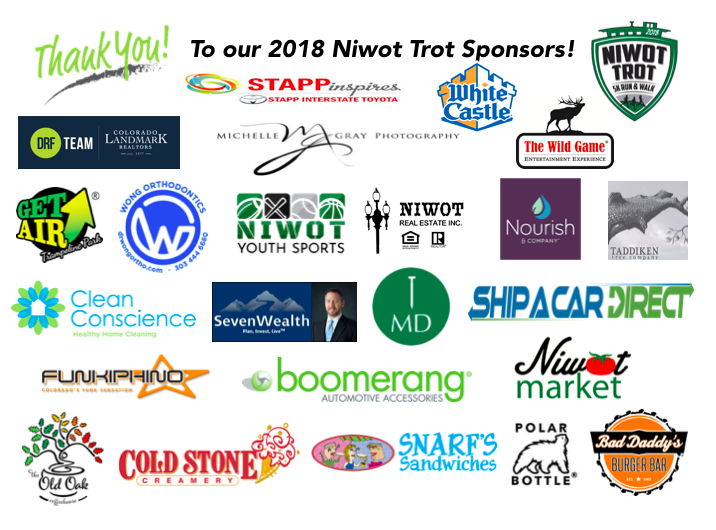 From awards and prizes, food and drink, to incredible professional services donated, the Niwot Trot would not be what it is without the superb support from our 25 sponsors. Please join us in thanking them for their commitment to putting on a top-notch event celebrating an active, family-friendly lifestyle while raising critical funds that directly support our NES students. Full results can be found online at https://www.finishlinetiming.com/2018-results-niwot-trot-5k.